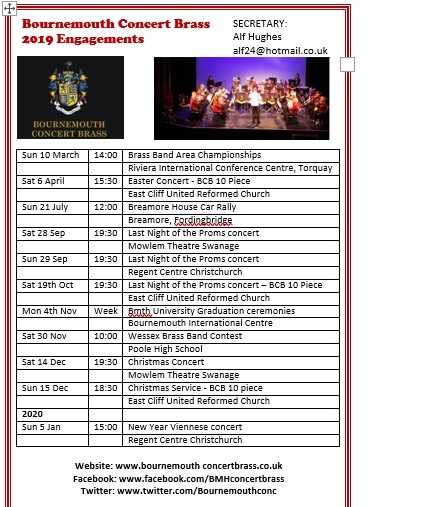 Bournemouth Concert Brass (BCB) are a brass band with a local history going back over 100 years incorporating various titles involving "Boscombe Silver" and "Boscombe Temperance". The band settled into it's current brand in 1975. All the players are amateur musicians who freely give of their time and talent. The band is able to maintain it's momentum in developing a high level of performance in two ways. The band are a contesting band and regularly take part in competitions around the country. Earlier this year the bank travelled to Torquay to play in the West of England 1st Section Championships and were very happy to come away with 2nd prize. This qualified the band to take part in the National Brass Band Championships which were held in Cheltenham in September 2017. The band were pleased to be placed 8th out of a field of 16 bands. The band has an extensive repertoire of music which includes traditional marches and hymn tune arrangements, music from the classical world, film, show and pop music arrangements and a collection of fine instrumental solo arrangements to allow our principal players to shine. The band has an established relationship with the Regent Centre in Christchurch and presents a number of concerts at this venue every year. 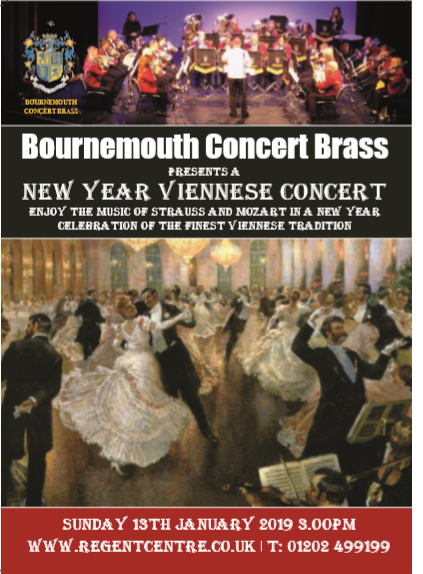 January is always our "almost world famous" New Years Viennese concert with a variety of well known Strauss arrangements mixed with other familiar music from that genre. Over 300 attended this years concert, which was a 5 year record attendance. During the summer we put on a themed concert, this year was under the title of 'Herores of the Skies'. Autumn is a packed house for our "Last Night of the Proms" concert. This is always greeted with enthusiasm and anticipation of the finale trio of Fantasia on British Sea Songs, Jerusalem and of course Pomp and Circumstance. Visit the engagements page and book early. For 24 years the band played in the Pinewalk bandstand in Bournemouth Gardens, the band is very proud of its association with the people of Bournemouth but due to Council cutbacks the band no longer has the opportunity to provide this service for the time being. Within the band we have members who are able to arrange music for brass band and smaller ensembles on request so if there is a piece of music you think would work well for a brass group, we would like to here from and try to accommodate your request. 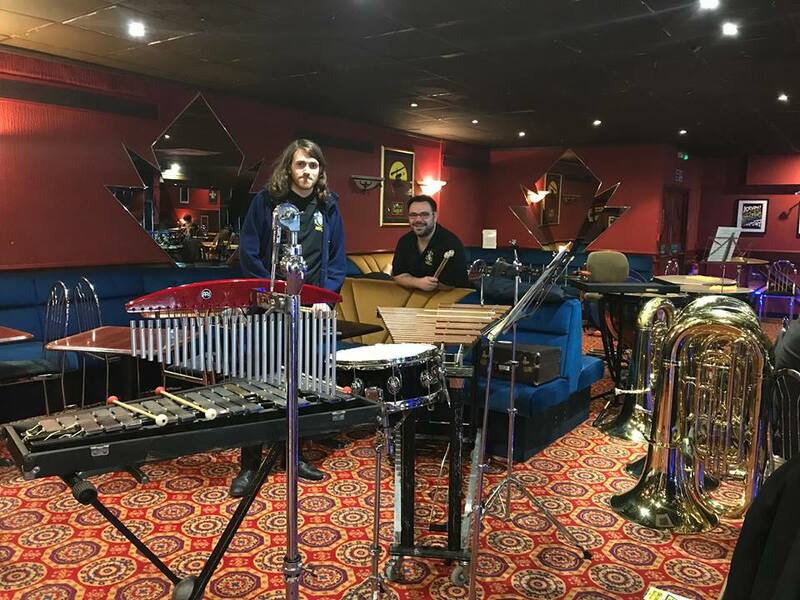 The band is always looking to develop new concert venues where the objectives are to (1) Explore and play new and exciting venues, (2) Engage with local Bournemouth business and (3) Share concert profits with local charities. Talk to us if you have any ideas or would like to come on this venture with us. We appreaciate that a brass band of 27 players requiesa resonably sized venue. If you require a smaller ensemble, the band is also able to provide 5 piece or 10 piece ensembles to suit individual requirements and smaller venues, and often play at Care homes, Hospitals and promotional events. We havea wide range of music from classical, show, film, modern and much more. Want to join us? - The band are looking to recuit a number of key players in the cornet and baritone sections in the coming months following the loss of some players through work moves out of the area. If you are interested in joining us then contact our Chairman or Secretary (details below). The band is always looking to attract players with good brass band experience in Championship or First section bands. Young local players looking to learn their brass band trade should also talk to us. Please look at the Band Profile pages to see the vacancies that are available. If the section you would like to join is filled, please still make contact as we may still be able to accomodate by moving players around.